Marching to the Beat of a Different Drum | 2P START! Oh those little Patapon, so cute, yet so deadly. I’m almost tempted to borrow my brother’s PSP and buy Patapon, which I’m told is a bargain at $20. It’s getting rave reviews far and wide and I’m itching to play it. While the PSP does have an increasing number of quality titles from all genres, most of them don’t make me curious enough to buy, steal, or borrow a PSP. Anyway, hope you enjoy our take on the Patapon, and let us know what you think of the game! Does anyone out there have more Patapon variations to suggest? I almost feel guilty for doing a comic like this. It’s so….simple. You probably won’t get them all, but you’ll get enough of them to make the comic worth your time. I love Satupon and the only one I don’t get is Patbon/Papelbon I probally know what it’s making fun of just don’t remember. I am tempted to buy the game, I loved locoRoco,just need to brush of the thick layer of dust of my psp. One of which you could of added would be patawan, cos star wars always works. I can’t believe we didn’t think of that! You’ve upstaged us already! Maybe we’ll save that idea if they ever make a Patapon sequel! I’m surprised some variant of “padawan” didn’t sneak in there! Great strip. I love it guys—simple, attractive, hilarious! Ack, narrowly beaten by Dande! I concede defeat. *Bows to applaud* I thank you. Though now I am stuck for anymore I peaked too soon. P.S. I has to be done but WOO! I got first post now I will hide in the corner ashamed at what I just did. NCG, and Ray shouldn’t feel bad, the comic is great, even if it’s not text/story heavy……er. And I still don’t get ‘Patajon Papelbon’. And why is ‘Patajuan’ half-asleep, isn’t that kinda….i don’t know….racist? @Tim: Is your 360 connected through an ethernet cable, or wi-fi? 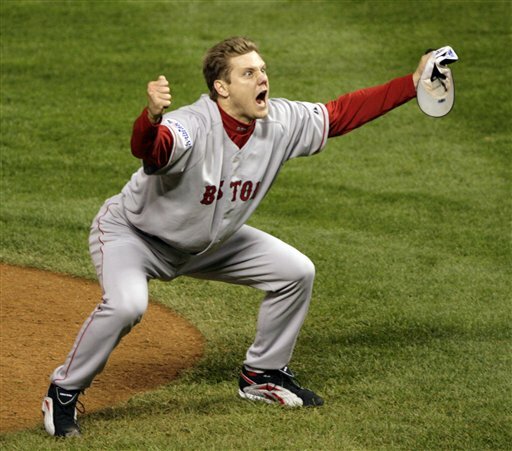 It’s a reference to Jonathan Papelbon, the closer for the Boston Red Sox, here’s the famous picture we modeled the Patapon guy after. His name just went well with the comic theme. And DJ, my 360 is connected through an ethernet cable, I don’t know why I can’t seem to play against you because I don’t typically have problems with LIVE anymore. 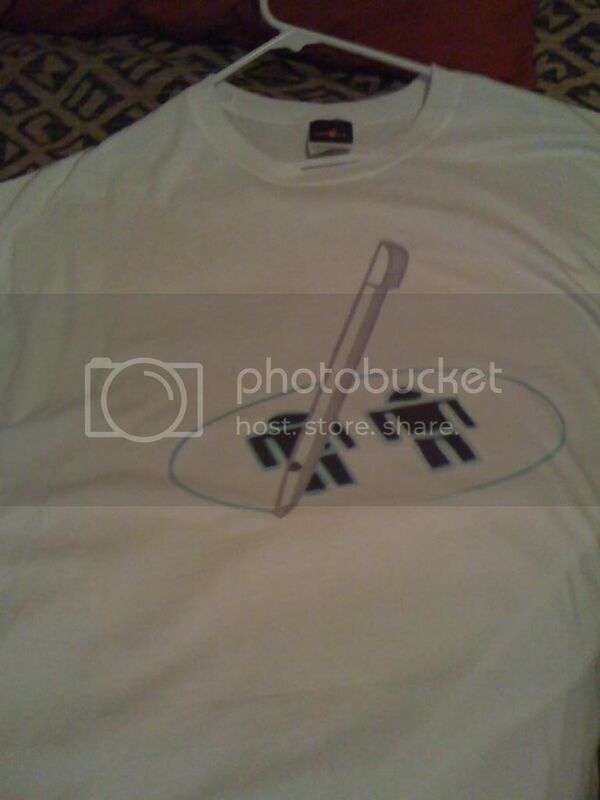 Here’s the pictures of the 2pStart shirt I had made 1 2 . Pictures are just so-so cause of the lighting in my room. I think it came out really well and I’m happy with it. @Tim: Neither do I, weird. I mean, mine is connected through wi-fi, but the last time when we tried to play Call of Duty I was at my friends house and using an Ethernet cable. I don’t know, maybe hiccups with live. XKCD fora have trained me in the art of papyrus rejection. I always like this type of comic. I loved the simplicity that made it was hilarious even if the viewer had never heard of the game (so don’t feel guilty Tim!) Very funny. I really loved this one. It was kind of simplistic I suppose, but the images and text combined to make a very enjoyable comic. Haha… that was great… Very clever and well-done. And dj75728: that is truely an awesome t-shirt. Yes, because our feeble minds cannot begin to grasp the concept of “sat upon”. Patapwned is the one that I like the most. Not very original yet still funny. Hmm… not too familiar with that game. The art looks cool enough. I’ve got to agree with you Tim that nothing has made me really want a PSP too much, except for one title. Not Patapon, but LocoRoco. Oohh how magical and happy! And yet none of the people (both) I know who have a PSP would buy it… figures. i don´t get the patagon…i think you mean from patagonia (sudamerica) right? Euh, where can i download the font? What font do u use? Frickin awesome dude! I always love your comics, so simple yet so amazing. Sometimes simple is best. how about gnatapon, like some kinda tiny flying patapon or something. Hey guys you should make another gears of war trailer using THIS song and see what sort of reactions you gett THEN. There is a Hatapon in the game. Herculanum. I think it comes standard on macs. Patapon is the best game i ever played! ??????? – ?????? ????, ? ??????? ? ?????-???? ?????! Definitely need a pataTron, fully decked out in circuitry. Also, patadon, as in the Godfather. The Ron Jeremy version: pataschlong. Gaah! For the last time, “pwn” is pronounced “pone”. seriously. I laughed so hard at the Satupon box I had to post. There is a download-able demo of Patapon at their site. Of course, you need the PSP. I am loving Patapon! Great fun. Actually I found you looking for info. I’ve been playing but today I restarted when I heard there is a Demo Only weapon you can take with you when you own the game. It’s a cool weapon. I highly recommend the game! Patapong. With the eyeball between two uprights. I suspect if you don’t get this, it means I’m really freakin’ old. Hey this is my first time writing in. I took up your challenge to count the number of times you said Pata in the podcast. As I was bored I also added in the amount of times you said Pon. is that a guitar hero guitar? I’m glad I wasn’t eating or drinking anything at the moment, because it would have been all over my keyboard and monitor. Ell-Oh-freaking-ell, dudes! A pun-centric comic? I like!